The story of an academic discipline is usually conveyed in grand movements and long spans, but it can also be told through the lives of individual scholars, through the development of specialties, through the creation and change of departments, and through the formation and transformation of organizations. 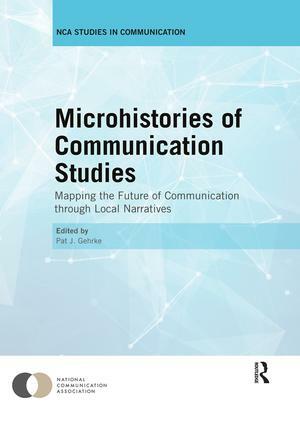 Using twelve histories of micro-dimensions of communication studies, this volume shows how sometimes small decisions, single scholars, individual departments, and marginalized voices can have dramatic roles in the history and future of an academic discipline. As a compilation of micro-histories with macro-lessons this volume stands alone in communication studies. Read as a companion to A Century of Communication Studies, the National Communication Association’s centennial volume, it offers rich detail, missing links, and local narratives that fully flesh out the discipline. In either case, no education in communication studies is complete without an understanding of the themes, challenges, and triumphs embodied by the twelve micro-histories offered in this book. This book was originally published as two special issues of Review of Communication. Pat J. Gehrke is Associate Professor, and Director of Speech Communication and Rhetoric, in the Department of English at the University of South Carolina, Columbia, SC, USA. He is the author of The Ethics and Politics of Speech (2009) and co-editor of A Century of Communication Studies (2014).